In spring, 1968, a shot rang out, and a bullet passed through the face of a man who’s voice we all recognise today. He fell, his spinal cord severed, and breathed his last breaths. Martin Luther King Jr., champion of black rights, had been shot dead by a white man even as the ugly face of segregation marched to its grave in the United States. Martin Luther King Jr. died for our sins, our sins which cause us to turn upon one another based on skin colour, parentage, sexuality, gender, political leaning or even just sport team support, and hack one another to death. He championed the rights of a people who had spent centuries under the yolk of white supremacy which had reduced black people to the status of animals in a state which prided itself for its freedoms, a state which had fought a war with itself over their future and yet still failed to see them as any more than an underclass. A state which had battled Nazi Germany and yet failed to see the horrors of a path strewn with discrimination and racial superiority. As Martin Luther King Jr. fell, he may have seen the light which was tolerance and the end of a road of campaigning. He may have seen a glimpse of freedom for his people, the right to just be equal. But due to the hatred of those who revelled in their superiority, he would never see it. Martin Luther King Jr. died for sins we developed but could cast aside, not for those that with benevolence and power he had condemned us to bear. He died to teach us the error of our ways and to live in peace with one another, not simply to spread the superiority of his people beyond a question of race. He died to show people a brighter vision of this world which we could bring about, not one where we would have to wait till death to see. He showed us that kindness and equality were human values to be shared selflessly, not for the gift of eternal bliss or the threat of eternal torture. Now, thanks to a man who championed equal rights for all, a black man holds the presidency of the united states. 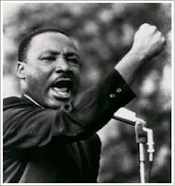 He inspired the movements of equality for all, whether that be racial, religious, or that of sexual orientation. He was a man who wanted justice, but received none in return. He did not call himself king, nor did he claim divine right. He dreamed a dream, and with that dream he made it reality. Why wear a cross about your neck, when you could wear a rifle, and remember Martin Luther King Jr, a man amongst many men, but a man who stood taller and more inspirational for his message. Reclaim the crucifix, remove the noble crown of thorns and know that this man never saw his dream come true, but not all must die as he died. That freedom is still possible, and can still be clutched. Freedom from tyranny, earthly or Godly.